Between 1879 and 1882, His Royal Highness Prince George of Wales served as a midshipman on-board HMS Bacchante, an ironclad screw-propelled corvette of the Royal Navy. These images are taken from the notebook that he kept during a voyage at sea in early 1880 [SGC M.146]. 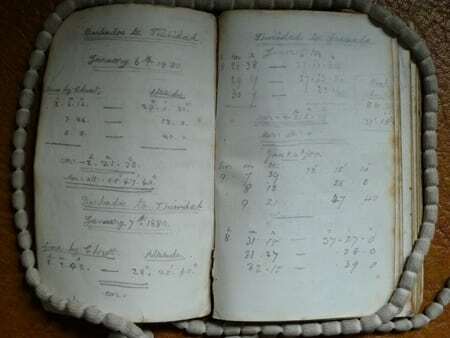 Among the notebook’s more serious contents are details of the journeys they made, notes on the physics behind the ship’s steam engine and a record of the condition of the crew’s hammocks and blankets. The more trivial include a list of “The old boats’ crew to whom I meant to give my photo to” and many doodles of sword-fighting stick-men. A grandson of Queen Victoria and the second son of her heir, Albert Edward Prince of Wales (later Edward VII), George did not have much expectation of ever inheriting the throne. He is alleged to have been very happy to pursue a career in the Royal Navy, which he began training for at Dartmouth in 1877. He continued in the Royal Navy, travelling the world and gaining several positions of command, until 1892, when the sudden death of his older brother placed him more directly in line for the throne. In 1910, following the deaths of his grandmother and then his father, he would come to the throne himself as King George V.
There had initially been great opposition from Cabinet ministers to the idea of sending Prince George and his older brother Prince Albert Victor (known as Eddy), then aged just fourteen and fifteen, away on a voyage. In the end they were persuaded by the princes’ tutor, John Neale Dalton, who accompanied them as tutor and chaplain for the duration of the journey. Typically, midshipmen lived in the gunroom, kept watches and ran the ship’s boats as well as receiving instruction in navigation and other aspects of seamanship every day. During Prince George’s time on HMS Bacchante, the ship toured many territories of the British Empire, including colonies in the Caribbean, South Africa and Australia. They also visited South America, the Mediterranean, Egypt and East Asia. Ten years later, Alfred Evans, formerly First Class Petty Officer and Captain of the Main Top on HMS Bacchante, came to St George’s as virger, a position he held until 1947. 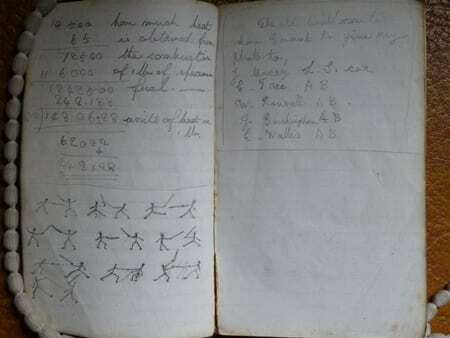 It was Evans who later presented this notebook to the St George’s Chapel Archives. Baillie, A.V., My First Eighty Years: 1864-1944 (London, 1951).